For 19 years, ex-Disney animator Gary Andrews and his wife Joy tackled life’s ups and downs together. During Gary’s trip home from Vancouver in October last year, Joy suddenly passed on from sepsis without having the chance to say goodbye to her husband, leaving the former Disney artist devastated from the loss. The same day Joy passed on was the only day that Gary failed to complete a proper illustration for his daily personal project called ‘The Doodle Diaries’. Through illustration, Gary was able to better manage his grief, pain, loss, and the need to adapt to change with the departure of his beloved wife. 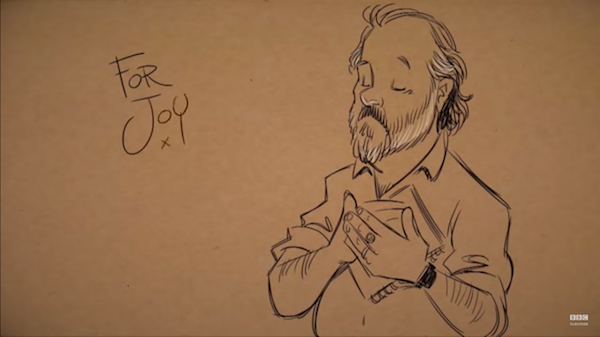 In this heartwarming animated tribute to Joy, Gary shows you what life was like following her death and having to take over caring for his two children as single parent. Watch the moving animation and his interview with the BBC below.